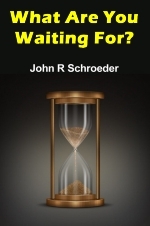 John Ross Schroeder - Writer for The Good News, Plain Truth & Tomorrow+*+s World Magazine. Compiled the Booklet: Answers From Genesis - Ambassador College Production. What are you waiting for?" said Ananias to Saul. "Get up, be baptized and wash your sins away..." (Acts 22:16, NIV). Now why would a Christian layman in the first century say a thing like that to Saul of Tarsus? Only three days before, Saul had been struck down by Jesus of Nazareth on his way to Damascus to torture Christians. He had spent the three days totally unseeing — blinded by the brightness of Christ's appearance. That unprecedented experience began the transformation of Saul from a self-righteous religionist into perhaps the greatest Christian of his time. Saul's future lifework was outlined rather immediately after his total about-face. But before he could become Paul, or even begin to commence to fulfill his Christ-given commission, Jesus inducted him into God's Work through the deeply symbolic ceremony of baptism. While Ananias was the Christ-sent human instrument that put the old Saul to death by dunking him under water, it was Jesus Himself who gave Paul God's Holy Spirit. But why would such a ceremony be necessary? Would not Paul's obvious repentance be sufficient? Why go to the trouble of being plunged under water — possibly fully clothed? How could the baptismal ceremony wash Paul's sins away? To begin to give an answer to these questions, it is necessary to understand that the cleansing concept of baptism is richly rooted in the pages of the Old Testament. Water baptism is prefigured by a number of graphic accounts in the first Testament. Perhaps the most poignant example is the symbolic baptism of all of Israel in the Red Sea — leaving the old, corrupt Egyptian way of life and emerging into the prospect of living their lives anew through the vehicle of the freshly revealed righteousness of God's law. The apostle Paul really grasped the Old Testament role of baptism and was deeply desirous of teaching its meaning to the Corinthian church. He wrote: "I want you to know, brethren, that our fathers were all under the cloud, and all passed through the sea, and all were baptized into Moses in the cloud and in the sea" (I Cor. 10:1, 2, RSV). Noah's Flood was also a type of New Testament baptism. Peter wrote: "... Eight souls were saved by water. The like figure whereunto even baptism doth also now save us... by the resurrection of Jesus Christ" (I Peter 3:20-21). Accounts of ceremonial cleansing by water are too numerous to fully document; nonetheless, here are just a few. The High Priest Aaron was not allowed to enter the Holy Place without first bathing his flesh in water (Lev. 16:1-4). Both husband and wife were to bathe themselves after marital relations (Lev. 15:16-18). Even after leprosy had disappeared, the patient was not dequarantined and restored to normal society without first washing his clothes in water (Lev. 14:8). On the occasion of many an animal sacrifice, the priest had to wash his clothing and take a bath (Num. 19:1-7). Naaman, chief general of the Syrian army, was afflicted by leprosy in the time of Elisha. He approached God's prophet to solicit total recovery. Elisha's instructions were: "Go and wash in the river Jordan seven times." That seemed silly to this dignified, perhaps even pompous, general of the army. Naaman just didn't want to do it according to Elisha's explicit directions. His reply was: "'Are not Abana and Pharpar, the rivers of Damascus, better than all the waters of Israel? Could I not wash in them, and be clean?' So he turned and went away in a rage" (II Kings 5:12, RSV). His aides later persuaded Naaman to cool off and put aside his vanity. He followed Elisha's seemingly "stupid" instructions and was totally healed of a terminal skin condition. The point is that the bathing of the flesh and the clothing that touched the flesh was the prescribed formula for ridding the Israelites (and willing Gentiles) of a whole host of physical and sometimes spiritual problems. God has always wanted men to be clean: physically, mentally and spiritually. But these water-based ceremonies in the Old Testament were only a type of the New Testament spiritual cleansing that finds its fulfillment in Christ. These pre-Christian antecedents could not really cleanse sinners of spiritual defilement and make them eligible candidates for God's Kingdom. Jeremiah put his finger on the problem: "Though you wash yourself with lye [a harsh cleansing agent] and use much soap [in water], the stain of your guilt is still before me" (Jer. 2:22, RSV). The apostle Paul puts the Old Testament ceremonial washings into even sharper focus: "According to this arrangement, gifts and sacrifices are offered which cannot perfect the conscience of the worshiper, but deal only with food and drink and various ablutions [washings], regulations for the body imposed until the time of reformation [Christ's blood sacrifice on the cross]" (Heb. 9:9-10, RSV). They could only be a sign. They could never really cleanse the mind itself. Jesus Christ did what all the offerings, sacrifices and ceremonial washings combined could not do. The shedding of His life's blood broke the barrier between God and man forever. Man's repentance followed by Christ's ministration to man of the Holy Spirit then actually changes the mind. However, all of those Old Testament washings did symbolically prefigure important New Testament principles, not the least of which is water baptism. John the Baptist built a bridge between Old Testament ritualism and Christ. His baptism paved the way for Christ's baptism of the Holy Spirit. It added more clarity to the picture of God's plan of salvation. John recognized that the proper mental approach — repentance — must precede baptism. He sharply rebuked the "religious" types of His day, saying: "Bear fruit that befits repentance" (Matt. 3:8, RSV). John would have no part of baptizing those whose attitudes were wedded to sin. Later he told those who were really willing to repent of their sins: "I baptize you with water for repentance, but he [Christ] who is coming after me is mightier than I... he will baptize you with the Holy Spirit and with fire" (verse 11, RSV). John the Baptist also set as an example the Christian ceremonial form of total immersion in water. "John also was baptizing in Aenon near to Salim, because there was much water there..." (John 3:23). Whether he learned this rite from Jewish baptizers in the Palestinian area or from direct revelation is an open question. What is clear is that Jesus endorsed John's method of total immersion. "Then Jesus came from Galilee to the Jordan to John, to be baptized by him. John would have prevented him, saying, 'I need to be baptized by you, and do you come to me?' But Jesus answered him, 'Let it be so now; for thus it is fitting for us to fulfil all righteousness.' Then he [John] consented. And when Jesus was baptized, he went up immediately from the water..." (Matt. 3:13-16, RSV). As many other New Testament examples affirm, the only valid form of baptism is total immersion in a symbolic watery grave. Only a complete submerging could properly picture the death of the "old" man (see Rom. 6:3-6). Actually, full immersion was generally practiced until the late 1200's A.D. In the year 1155, theologian Thomas Aquinas wrote: "Baptism may be given not only by immersion, but also by affusion of water, or sprinkling with it. But it is the safer way to baptize by immersion, because that is the most common custom" (quoted by Wall, His Baptism, vol. II, pp. 391-393). Further: "Thirteen hundred years was baptism generally and regularly an immersion by the person under the water, and only in extraordinary cases a sprinkling or pouring with water; the latter [sprinkling or pouring], moreover, was disputed — nay, even forbidden" (Brenner, Catholic History, p. 306). Even today some few denominations still teach baptism by immersion. Any other method is merely man-made tradition and contrary to God's inspired New Testament teaching. Of course, total immersion of and by itself is no more effective, spiritually speaking, than scrupulously washing a bunch of pots and pans. Water has no mystical or magical effects on the person immersed. But the symbolism is so profound that the candidate must demonstrate his repentance and faith by literally observing the baptismal ritual. So much is this true that even after the Gentile Cornelius and his household had received the Holy Spirit before water baptism — a very rare exception to normal procedure — the apostle Peter said to them: "'Can anyone forbid water for baptizing these people who have received the Holy Spirit just as we have?' And he commanded them to be baptized in the name of Jesus Christ" (Acts 10:47-48, RSV). The simple rite of water baptism is meant to mark a miraculous change in the repentant sinner. It is an embarking on a new, clean, right way of life that will end up in great reward and happiness. Its symbolism is meant to instill a permanent change of direction, with spiritual cleansing throughout the remainder of one's natural life. Once you" are truly baptized, there is no longer need for further physical rites as previously required in the elaborate ritualistic system of the Old Testament. From then on when you stumble and sin, Christ cleanses you symbolically with His blood (I John 1:7-9), and "with the washing of water by the word" (Eph. 5:26). Through continual repentance, prayer, and habitual Bible study for the purpose of personal correction, the true Christian moves steadily in the direction of a perfection which was not possible through repeated physical ablutions and washings. It is absolutely worse than useless to go through the baptismal ceremony without really repenting of your sins first. God simply will not honor such a baptism. Peter, in his very first sermon following the inauguration of the first-century Church of God on the day of Pentecost, gives the baptismal candidate the correct order of events: "Repent [first], and be baptized everyone of you..." (Acts 2:38). However, no matter who you are, once you have really repented there is no longer any reason to delay water baptism. Six month's probation, or some such other stipulation, is not required. The following three booklets and articles are highly recommended for additional reading in conjunction with the biblical topic of baptism. Is water baptism essential to salvation? What about the thief on the cross? Should babies and children be baptized? Suppose you were baptized "in the name of the Father and the Son, and the Holy Spirit"? Should you be baptized over again in the name of Jesus only? Must the ordinance be performed by an ordained minister? 2) How You Can Be Imbued With the POWER of God! The Church in apostolic days was filled with power. Yet today many professing Christians are spiritually lifeless. Why? And how can you, yourself, be filled with the power that motivated the early Church — the power of God's Holy Spirit? 3) Just What Do You Mean...Conversion? Is it possible for one to actually sin, while he or she is a Christian, and still remain a truly converted Christian? — Few know how one is converted — whether suddenly, all at once, or gradually. Does conversion happen immediately, or is it a process?